Lynyrd Skynyrd (pronounced /ˌlɪnərd ˈskɪnərd/ LIN-ərd-SKIN-ərd by band members but sometimes pronounced /ˌlɛnərd ˈskɪnərd/ LEN-ərd-SKIN-ərd) is an American rock band, formed in Jacksonville, Florida in 1964. The band became prominent in the Southern United States in 1973, and rose to worldwide recognition. 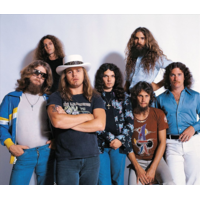 Three members and one road crew member died in an airplane crash in 1977; the band reformed in 1987 for a reunion tour with lead singer Ronnie Van Zant's younger brother Johnny as the frontman. Lynyrd Skynyrd continues to tour and record. Of its original members, only Gary Rossington remains with the band as of 2011. The band was inducted into the Rock and Roll Hall of Fame on March 13, 2006.